With the closure of WB I-696 throughout Macomb County now 3 days old, it is a good time to provide a progress update. As soon as all the ramps to and from WB I-696 were safely closed early Saturday morning, April 28th, pavement removal operations commenced. As of this morning, the first 4,000 feet of pavement in the vicinity of M-3 (Gratiot Ave) have already been removed. Other work that has begun: video inspection of the storm sewer system, installation of new drainage structures and excavation for new base material. We are now less than 2 weeks away from the first new pavement being placed. As we move forward, we will continue to monitor and adjust traffic signal timings as new traffic patterns develop from traffic diverting away from I-696. Work in Oakland County begins TONIGHT! 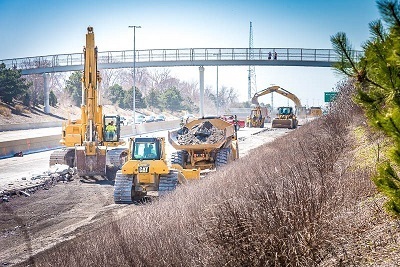 Three lanes will be closed on WB I-696 between I-75 and US-24 (Telegraph) and will continue nightly throughout the week as preparations begin for the first full closure weekend in the same limits. This first full closure to complete concrete pavement repairs is tentatively scheduled to begin Friday, May 18th at 9:00pm and end Monday, May 21st at 5:00am, weather permitting. In addition, you might see intermittent shoulder closures on WB I-696 between Telegraph and M-5 in the coming days for drainage improvements.